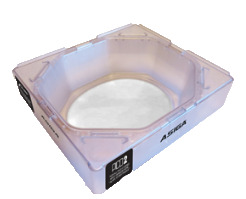 This is the new Asiga seamless build tray that will fit all Pico Plus and Pico2 and Pico2HD model machines. On Legacy Pico Plus machines these trays will require either a small modification of your existing handles/clamps or we have new stainless handles available for only $25 per set. The modification or change out can be done in under 30 minutes. We provide instructions if you choose to do the modification. These super strong trays no longer rely on adhesive to connect the Teflon film to the rigid tray. The angled walls of the tray keep the resin stirring throughout the build that can be a benefit for resins with pigments or resins with nano-particles. These trays are designed to match the shape of the tension rings to assure alignment. Please Note that this is a Single Tray. We offer a pack of 2 Trays as well.